After you have been pulled over by law enforcement under the suspicion of drunken driving, you are naturally inclined to be worried. Officers who suspect a motorist of drinking and driving will administer a field sobriety test, which makes a person’s anxiety increase. Regardless of anxiety, and regardless of whether you are sober or not, you need to know how to behave during that test so that the officer knows you are fine to drive. If you fail the field sobriety test, the officer will likely follow up with a breathalyzer. However, you could still be arrested if you fail the field sobriety test (whether you were over the BAC limit or not). The officer must provide you with instructions on how to perform the field sobriety test, but from there, it is up to you and how you act. Do maintain your balance. Proper balance is critical for a field sobriety test. Officers want to ensure that you are stable enough to drive, which means being able to stand up straight and not fall over when walking in a straight line. While this is not the only thing you are judged on, if you cannot walk a straight line or if it appears as though you have no control over your body, it is a red flag to officers. Do not run from the officer. Even if you are guilty of drinking and driving, do not run when the officer has you step out of the vehicle. The officer may have you perform numerous tests, and the best way to convince an officer that you are guilty is to run from him or her. Not knowing the alphabet. You may be asked to recite the alphabet (forward and backward). While most people know the alphabet, it is not uncommon for a person to become too nervous, especially at the point when he or she must recite it backwards. You can always practice, but at least know the alphabet and make sure that you can recall the letters. Fooling around when asked to balance on one leg. If you are asked to balance on one leg, do not fool around or strike funny poses. While you might be joking, a relaxed demeanor that suggests that you are not taking the test seriously could make the officer assume that you are inebriated. Arguing with the officer or being too energetic. While you are upset and nervous, do not act too anxious. 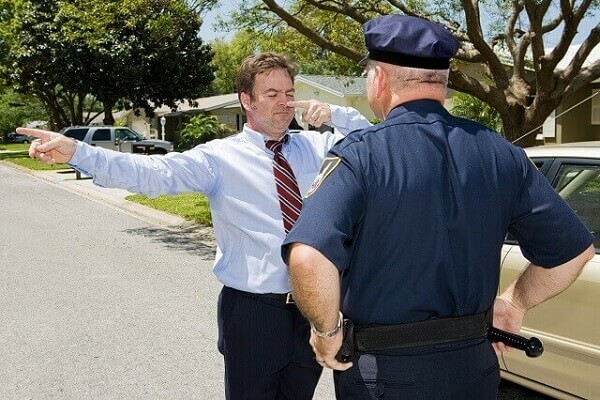 Officers know what normal anxiety looks like, but if you are overly energetic or trying to share your “buzz” with the officer, he or she could arrest you regardless of how you perform on the field sobriety test. If you failed a field sobriety test and now you are being arrested for a DUI, it is imperative that you contact an attorney. Christian A. Schwaner, P.C. has years of experience defending those arrested for a DUI. As a former prosecutor, he offers you peace of mind and the aggressive defense you deserve. Schedule a consultation with him today by calling him at 719-577-9700 or request a consultation online.